When nighttime falls in the mountainous jungles of northern Vietnam one wouldn’t usually expect it to be quite cool and comfortable—especially in July, when I did a homestay with members of the local Muong community in Ngoc Son Ngo Luong, Hòa Bình Province. But while our lodge wasn’t a five-star hotel with air-conditioning, it was situated right next to a rushing waterfall, allowing a constant flow of wind to run through our exposed shelter. And while there was no infinity pool, one could wade—if so inclined—in the forest river. This wasn’t an ordinary vacation to Vietnam, but neither was it a rugged expedition. I was invited on behalf of the Capsule crew by Sens Asia Travel, a sustainable tourism organizer aiming to provide an alternative experience for intrepid travelers. Their mission is to showcase the wilder side of Asia in a manner that allows both locals and tourists to enjoy and benefit from the visit. Less than 20% of Vietnam is flat, and aside from the main cities and beach resorts very little of the country is exposed to tourism. It’s predominantly a land of densely forested hills, tropical lowlands, and muddy rivers that can regularly flood with a vengeance. It’s a far cry from the resorts of Da Nang or the metropolises of Hanoi or Ho Chi Minh City, but it’s just as equally Vietnamese. 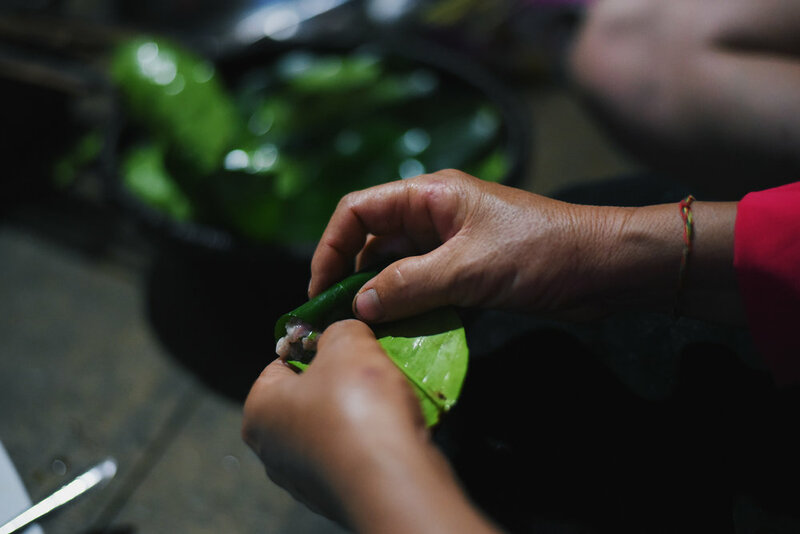 In Hòa Bình, the local Muong community we stayed with taught us how to forage for certain types of herbs, while Sens Asia invited celebrity Iron Chef Nguyen Van Tu from Hanoi to prepare appetizers for the local community. Ultimately, the experience Sens Asia provides strives to allow tourists to experience local life and food in a way which enriches communities, while nourishing the minds of overworked city dwellers. Already in Hong Kong there’s the notion of a diverse Vietnamese cuisine beyond spring rolls and pho, but it’s another experience when you roast ngoc leaves stuffed with pork underneath the shade of a cypress tree and chase them down with shots of rice moonshine. These experiences help maintain and respect local traditions, while opening up a treasure trove of inspiration to the world.